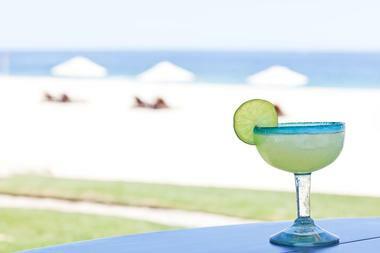 Staying in Los Cabos is your ticket to tropical relaxation. All-inclusive resorts in the area frequently have their own private beaches as well as pools, so you can choose where to take a dip. Factor in other amenities such as spas, fitness centers, golfing, and more, and you have the recipe for the perfect vacation. With one of these all-inclusive resorts, you don’t have to worry about food, drinks, or activities to pass the time as everything is already included. Whether you want to travel with your family, as a couple in search of romance, or with friends for a bonding vacation, you will easily find a resort to meet your requirements. Breathless gives guests amazing views of the ocean as well as of the yachts sitting in the marina. This adults-only resort aims to please those in search of romance and fun. Each of the 169 rooms is a spacious suite with a huge bathroom featuring double sinks, a minibar that is complimentary and refreshed daily, and a furnished balcony. When you stay here, you get access to two pools, each of which has a different feel. One is “quiet” while the other is a “party” pool. Breathless has a great spot along Medano Beach that is swimmable and safe, a rare combination. There are also lively performances at night at the rooftop bar. Relax and recoup your energy at the spa or simply enjoy the free wireless internet on the property. Just some other extras include yoga classes, group activities like giant Jenga, and tequila tastings. There is also a gym if you want to get a workout in. Enjoy your meals at one of the 12 restaurants and bars, which include beachside and poolside bars. Just keep in mind that drinks at certain bars aren’t included in the all-inclusive. This beachfront resort provides guests with umbrellas and sun loungers so that they can make the most of the gorgeous sand and water. The suites are contemporary in style with modern amenities. All have balconies, and some have views of the ocean. 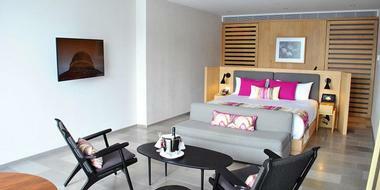 They also include free minibars, with some rooms having even larger minibars. The property has wireless internet. The 308 suites all have premium cable on flat-screen TVs, rainfall showerheads, bathrobes, slippers, hairdryers, toiletries, and coffeemakers. Some rooms have living spaces, dining areas, and kitchenettes. You can take a dip in one of the two outdoor pools, each of which has a swim-up bar. Relax at the spa to get a facial, massage, or wrap. Take an outdoor yoga class or head to the gym. Expect nightly shows as well as a DJ by the pool. Although you can hang out on the beach, the water is typically too rough for swimming. If you come with your kids, they get access to the Explorer’s Club, which is filled with activities. There is an exclusive lounge for Preferred Club guests. The all-inclusive rate for the resort includes all four bars and seven restaurants, offering international and French cuisine as well as seafood and more. This hotel aims to provide guests with luxury and exclusivity. 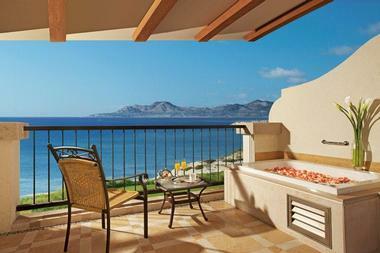 There are 249 guest rooms and suites, featuring private balconies with spectacular views. Rooms have two full or one king-sized bed with hypoallergenic bedding and extra quilts available. They also have kitchenettes with microwaves, sinks, and minibars in addition to safes, LCD flat-screen TVs with cable plus pay-per-view, phones with voicemail, air conditioning, ceiling fans, irons, and ironing boards. Suites and villas can add dining and living areas, full kitchens, larger bathrooms, hydro-massage tubs, and/or Jacuzzi tubs. Get pampered at the SOMMA WineSPA, which is the only spa within Mexico that uses wine to help with treatments. The modern gym is well equipped, or guests can head outdoors to play tennis or go horseback riding, motorcycling, diving, or fishing. The restaurants serve traditional Mexican food as well as international dishes. 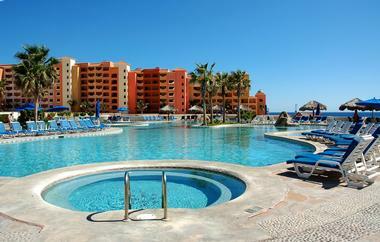 The Hacienda Encantada Resort is a resort as well as a residential area set amidst paradise. The suites combine luxury with traditional Mexican style, including handcrafted furnishings and textiles, vibrant paintings, and hand-crafted rugs. All rooms have bathrobes, slippers, sitting areas, cable TV with premium channels, balconies, fridges, microwaves, kitchenettes, minibars, room service, sofa beds, toiletries, hairdryers, irons, coffee and tea makers, free local calls, and voicemail. Accommodations can also include multiple bedrooms. Catch up with daily occurrences with the free newspapers or just relax in the Holistic Spa. Take advantage of the fitness center, concierge desk, pool games and bar, activity center, and two pools plus a hot tub. There is also a shuttle for the airport and downtown as well as a town car and limo service. You can enjoy authentic Baja food at La Marias or La Trajinera or a drink at El Patio. Other on-site dining options include La Pergola, El Eden, Barolo, Il Forno, and Los Riscos. This all-inclusive resort is right along the beach and features modern, fresh interiors perfect for families. The spacious marble bathrooms have a high-end feel and every room has its own balcony and sitting areas. Other amenities include stocked minibars, flat-screen TVs, iPod docks, Nespresso machines or a filter coffeemaker, air conditioning, ceiling fans, and rainfall showerheads. You can choose a room with separate living rooms and Club Lounge Access. There are clubs for both kids and teens, including a large kids’ pool. Or visit the freeform pool with its hot tub and bar or the separate adult pool. Send your kids off to play while you visit the luxurious spa with its outdoor treatment cabanas and hydrotherapy pools. Expect live entertainment in the theater and by the pool and the gym is open 24 hours a day. The entire property has free wireless internet. There are a wide range of dining options, including French, grill food, upscale Japanese, and a 24-hour café. You can get a drink at the sports bar or piano bar, in any restaurant, or by the pools. 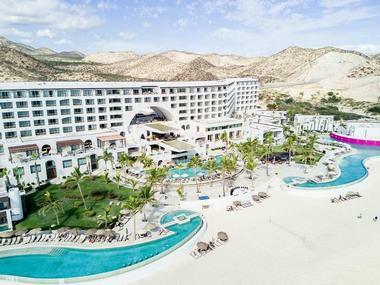 This adult-only resort features only suites, ensuring that all guests experience luxury at the edge of the Baja peninsula. 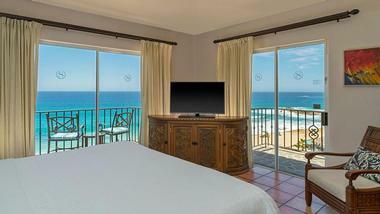 Suites have views of the gorgeous Mar de Cortes along with hot tubs and furnished balconies. Every suite has satellite TV, ocean views from a private terrace, a CD player, a Jacuzzi tub and separate shower, double sinks, a minibar that is refreshed each day, a safe that holds a laptop, nightly turndown service, wireless internet, L’Occitane toiletries, a sofa bed, an iron with ironing board, iPod dock, hairdryer, slippers, and bathrobe. Pamper yourself in the full-service spa or chill off in one of the three sparkling pools. That spa covers 13,000 square feet with treatments that include seaweeds, salts, essential oils, and clay and salon services. The resort always has activities going on for those who are interested, including dance lessons, tequila tastings, snorkeling, scuba excursions, and archery. There are weekly themed parties and live entertainment every night. All meals and drinks from the five restaurants and two bars are included in every stay, plus 24-hour room service. Options include fine French, Asian-style, and casual al fresco meals. 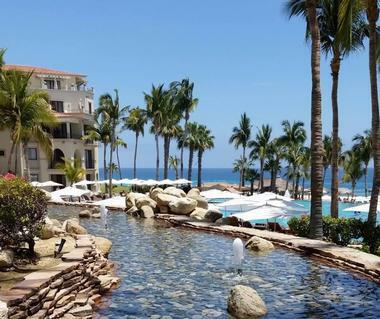 One of two Melia resorts in Cabo San Lucas, ME Cabo is a lifestyle resort that is along the only swimmable beach within Los Cabos and with views of El Arco. Each room and suite delivers luxury with modern technologies plus private terraces or balconies with furniture and views of the ocean or garden. The bathrooms have deep soaking tubs and rainfall showers. They also feature flat-screen TVs with cable, irons, safes that fit laptops, and hairdryers. Some also have minibars or hydro-massage bathtubs. Visit the YHI Spa named after the goddess of light and perfect for serenity. Guests have access to a gym, laundry services, dry cleaning, babysitting services, and a wellness program with yoga, SUP yoga, and mat Pilates, plus high-speed internet access. The property also has two heated pools and poolside Bali beds. 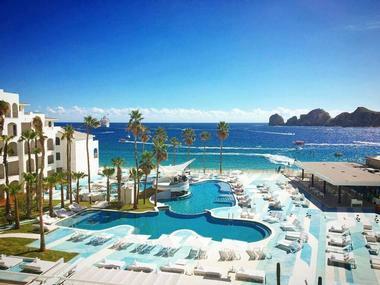 Get a drink, lunch, or dinner at the Blue Marlin Ibiza Los Cabos Beach Club, which is poolside and has a DJ play at night. Or get a drink at the Rose Bar, Dare Bar, Wet Bar, or Main Bar. You can also eat on the deck right by the water. This resort provides additional privacy via the standalone villas that are part of the larger space, offering incredible spaciousness. No matter where in the resort you are, you will have amazing views of the ocean thanks to its location along a cliff. The villas include washers and dryers, gas fireplaces, kitchens, private pools, and Jacuzzis. Upon arrival, guests receive champagne and fruit plates. There is private concierge service and daily housekeeping. There is a total of 151 villas, each of which covers more than 2,000 square feet and has three-and-a-half bathrooms and three bedrooms. Other highlights include dining rooms that hold six people, two spacious decks, Weber Grills outside, and wireless internet. Guests get access to the Jack Nicklaus golf course as well as a large infinity pool with amazing views. Thanks to the umbrellas and lounge chairs, many guests choose to eat lunch here. The spa and fitness center are sleek and modern. The spa has seven treatment rooms, including two for couples, plus a salon. Guests can opt for an all-inclusive package or purchase meals a la carte if they don’t want to cook. CIBOLA has international dining inside or out and guests can access bars and restaurants at nearby sister properties. 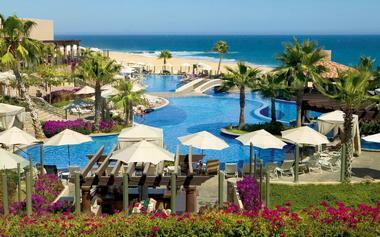 Paradisus Los Cabos is one of the few resorts in this area to sit along a swimmable beach, making it unique. The oceanfront rooms have amazing views and the grounds themselves are lovely. This all-inclusive resort has 305 rooms with warm tones as well as features like flat-screen satellite TVs, minibars, irons and ironing boards, hairdryers, and alarm clocks. Some also include access to the Executive Lounge. 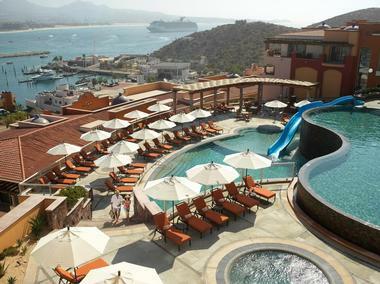 To complement the swimmable beach, this resort has a beachfront pool and swim-up bar, which is just one of three pools. 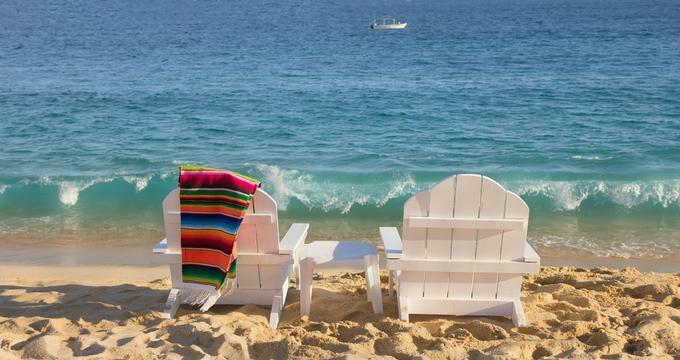 Guests can take advantage of shuttles going to Cabo San Lucas. The property is kid-friendly with kids’ clubs and playgrounds. Other activities include volleyball, beach games, video games for teens, yoga, Zumba, beach football, fitness, table tennis, dance classes, a range of workshops, and live music at night. There are seven restaurants to choose from with world-class a la carte meals, or room service is available 24 hours a day. Cuisines include international, Japanese fusion, modern Mexican, an Italian steakhouse, and Basque. Have a drink at the Avenue or Gabi Bars. This resort has a Mediterranean style and delivers boutique services and full-service amenities like those you would expect from the best hotels in the world. Junior suites have more than 525 square feet of living space as well as ocean views, a stocked kitchenette, and space for four guests in two double beds. Luxury suites are 750 square feet with a private bedroom, separate dining area, and kitchenette stocked for six. All rooms also have 24-hour room service, twice-daily housekeeping, TVs with premium cable, premium bath amenities, feather-top mattresses, a pillow menu, plush bathrobes, in-room safes, and the option of in-room massages. From the resort, guests get direct access to El Medano Beach, and those who go with the all-inclusive plan get wireless internet. Guests can access the fitness center next door as well as the full-service spa and salon there. The property has a large free-form swimming pool and hot tub plus a kids’ club. Guests also have access to the Quivira Golf Course. The property has three restaurants and bars with an additional two bars and five restaurants on the sister properties. Enjoy international meals, fresh seafood, Mexican cuisine, sandwiches, burgers, and more. This resort is adult-only and offers views of the Pacific. The rooms are large and modern, featuring furnished balconies, free minibars, coffeemakers, and other amenities. The whole property has free wireless internet. Forty-seven of the 201 rooms have additional amenities, including Beats Pill speakers, teak furniture, 24-hour butler service, and an exclusive VIP lounge. All rooms have flat-screen TVs and premium cable and air conditioning. The beach features lounge chairs, waiter service, and cabanas. Or you can swim in one of the two pools or hot tub, where you will also find lounge chairs. Get a workout in the TechnoGym with its air conditioning or relax at the spa for a facial, massage, or scrub. The resort is right next to the Quivira Golf Club. 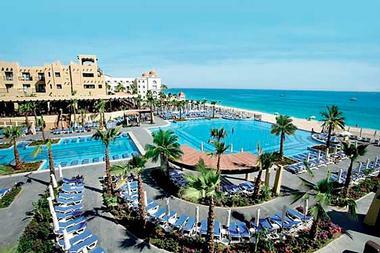 The all-inclusive rate includes 24-hour room service along with five restaurants and four bars. Food choices include traditional Baja dishes, buffets, snacks, sandwiches, and more. Some of the restaurants at the sister resorts are also included in the all-inclusive rate, while others are accessible but require payment. 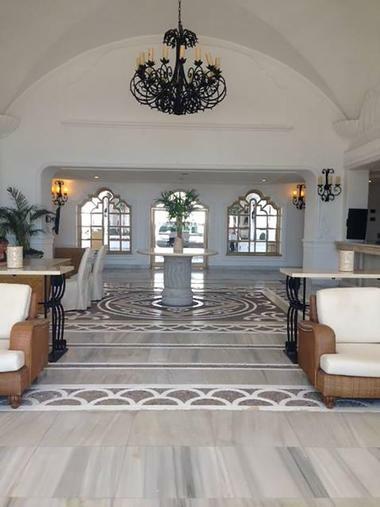 Right along El Medano Beach, this resort and spa has distinctive walls tinted rose along with marble busts, a Neptune statue, and gleaming domes. Junior suites have more than 540 square feet with two doubles or a queen bed, an open living space with chairs and a table, a spacious bathroom, and a full kitchenette. Luxury suites cover 715 square feet with private bedrooms with the same bed choices plus a TV armoire and a queen sleeper sofa. All accommodations feature plush bathrobes, premium toiletries, pillow menus, feather-top mattresses, 24-hour room service, and TVs featuring premium cable. 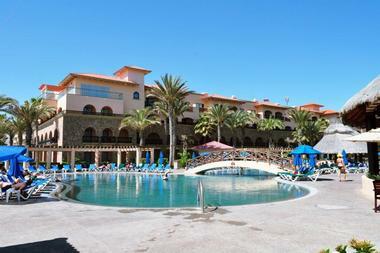 Guests at this resort have access to a private segment of El Medano Beach and wireless internet. Guests can work up a sweat in the fitness center or relax and be pampered in the full-service salon with spa. The tennis courts have lights to play at night and there is a kids’ club. There is both a spacious free-form swimming pool and a children’s pool space. There are several shops on site for items you forgot, souvenirs, or clothes. The property has six restaurants and bars, along with three more of each on the sister properties. Dining options include outdoor grill food, upscale Italian, sushi, and more. 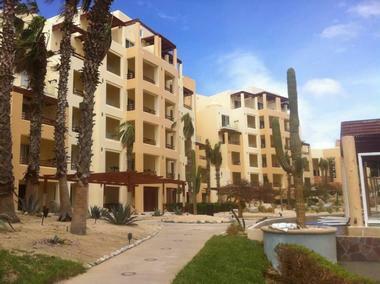 This resort overlooks the Pacific Ocean and is within Quivira Los Cabos, an exclusive residential community. The all-inclusive resort has junior suites with two queens or a king bed, a living area featuring over-sized chairs, and a kitchenette. The larger executive suites have more than 1,088 square feet with the addition of a sleeper sofa. super executive suites add Jacuzzis and even more room. Other in-room amenities include wireless internet, TVs, premium cables, premium bath amenities, safes, plush bathrobes, and housekeeping twice a day. Guests can enjoy the fitness center or visit the full-service Spa at Sunset Beach with its salon. Take a dip in one of the six swimming pools or relax in the hot tub. There is the Sunset Beach Kids Club as well as a teens’ club and playground. Guests of all ages can enjoy yoga, tours, classes, tennis, volleyball, or golf. There are a whopping ten restaurants and bars on the property for guests to dine at. Riu Santa Fe is right outside Cabo San Lucas, making it a bit quieter than other resorts and meaning that the water taxi to the marina is quicker. The rooms have palatial bathrooms and some rooms have amazing views. The entire hotel has free wireless internet. Rooms can also include Jacuzzis, hydro-massage bathtubs, dressing rooms, minibars with beverage dispensers, satellite TVs, and/or sofas. Guests can relax in the huge pool with space for a large number of guests while their children enjoy the separate kids’ pool. There are also Jacuzzis for romance and relaxation. Guests can go to the spa for a massage or other treatment. The fitness center is sunny and has a range of cardio machines. Expect entertainment almost every night, which is included in your rate. Guests can also dive, bodyboard, windsurf, do gymnastics, kayak, golf, or participate in watersports. There is a swim-up bar along with a total of four bar and restaurant choices. 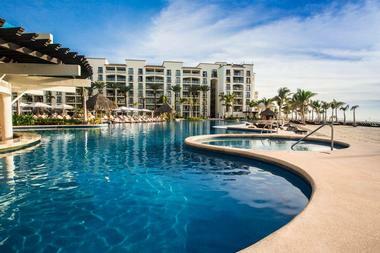 Royal Solaris is among the more affordable options for those in search of an all-inclusive resort catering to families. Rooms include furnished balconies, coffeemakers, and minibars. There are 390 rooms in total, with traditional furnishings and minibars fully stocked with free water and beer. Other amenities include flat-screen TVs, work desks, and tables for two. Some also feature jetted tubs, modern wood furnishings, and murphy beds for families. There are three outdoor pools, one of which is adult-only. These are just steps from the amazing beach. The resort offers complimentary activities during the day along with evening entertainment. Guests can visit the spa, play volleyball, play tennis, or do scuba diving training. Younger guests will appreciate the teens’ club, kids’ club, and water park which includes a few slides. 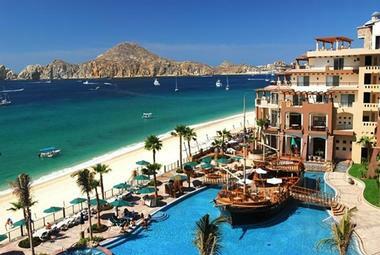 The property has four restaurants along with four bars, including a swim-up bar, and two choices for a la carte meals. The buffet even has nightly themed dinners or guests can enjoy room service for a very small fee. One of the best parts of this resort is its sprawling beach with pristine sand and numerous palapas to provide shade. Some rooms include standalone jetted tubs. The 250 rooms are bright and airy and feature two double beds or a king bed in addition to flat-screen TVs, balconies, and coffeemakers. The mini fridges have soda and beer, with a drinking water jug in the room. The bathrooms have Bio toiletries and shower/tub combinations. Some rooms also have Nespresso machines and chic living areas. There are four outdoor pools, so none should get too crowded; one of these is a VIP pool and another includes a swim-up bar. The spa has a sauna as well as a hydrotherapy area. Visit the modern fitness center or play at one of the two tennis courts. Daily activities include pool games, beach stretches, and aerobics. Parents will appreciate the baby club and kids’ club, while everyone can take advantage of the free wireless internet. Guests can dine at one of the three specialty restaurants or the sleek buffet. In addition to the swim-up bar, there is also a terrace bar and two lounges. This resort from Secrets delivers an adult-only luxury experience. Rooms include minibars that are refreshed each day with juice, soft drinks, beer, and bottled water. The 500 guest suites all have two double beds or a king bed, a private furnished balcony or terrace, and a full bathroom complete with a whirlpool. Other amenities include TVs with USB access, fans, air-conditioning, safes, coffeemakers, iPod docks and alarm clocks, irons with ironing boards, hair dryers, full length mirrors, slippers, bathrobes, desks, and pillow menus. The resort prides itself on its Unlimited Luxury® service, which includes 24-hour concierge and room service, wait-service on the beach and by the pool, daily maid service, endless activities, theme parties, entertainment venues, oceanfront bars, free calls to the US and Canada, and free wireless internet. The resort also has golf, two pools, the Secrets Spa by Pevonia, shopping, and a fitness center. There is unlimited access to gourmet dining a la carte without any need for reservations. There are five a la carte restaurants, a grill, a buffet, and a café. The spirits include unlimited domestic and international top-of-the-shelf drinks. Just 6 miles away from Cabo San Lucas’s downtown, the resort has spacious rooms with Old Mexico styling and their own private balconies. 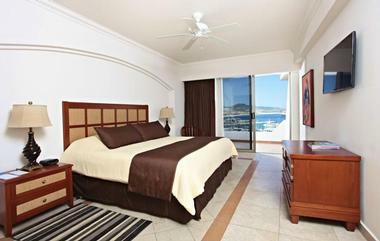 Every room has air-conditioning, wireless internet, a mini bar, a Sheraton Signature Bed, great views, and Jacuzzi tubs. They can also include multiple LCD TVs, dining tables, separate living rooms, full kitchens, the ability to connect with other rooms, an extra half bathroom, multiple levels, and multiple furnished terraces. Get pampered at the Cactus Spa with its hacienda styling. Go golfing at the Cabo del Sol’s Desert and Ocean courses. When you want some adult time, send your kids to the Sheraton Adventure Kids Club for supervision and fun. There are five pools to choose from, along with access to Tortuga Beach, a private bit of beach. There are water aerobics, basketball, and volleyball in the pools and the kids’ pool has a slide. Guests can also take advantage of the activities desk, outdoor whirlpools, steam room, sauna, and Sheraton Fitness Center. Have poolside snacks or take advantage of the swim-up bar. 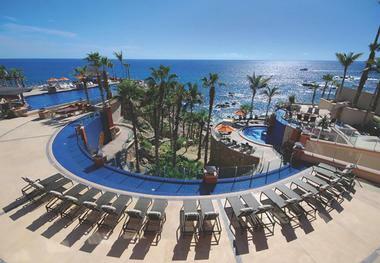 This resort covers 7 acres of land and sits on the Baja Peninsula’s cliffs with views of El Arco and the Sea of Cortez. 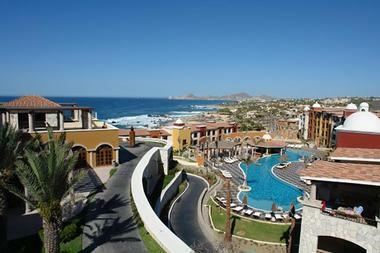 The resort combines contemporary Mexican elegance with rustic charm in the penthouses and villas. All have sleek private bathrooms, travertine stone flooring, custom furniture, full kitchens and granite counters, washers, dryers, and stainless-steel appliances. Suites have dining rooms, dens with flat-screen TVs, spacious private balconies, Bose Wave systems, and wireless internet. Some balconies even have hot tubs. 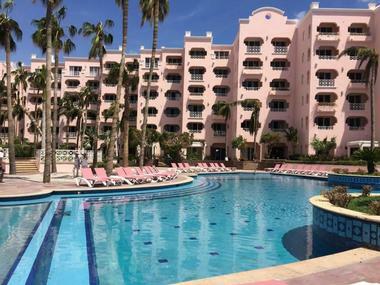 The resort features “Inspired Experiences,” including adventures, Mexican fiestas, and pool party Sundays. 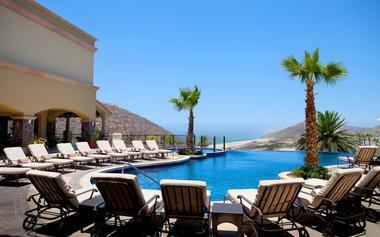 The property has two infinity edge pools that look out over the Sea of Cortez. Estrella has indoor and outdoor seating and is where you will enjoy all three meals of the day. Guests can enjoy the pool table, games, private beach cove, and fitness center. You will find traditional Mexican dishes, simple favorites, wood-fired pizzas, Baha-Med specialties, and everything between. There are also two outdoor bars, one of which is swim-up. The Ridge was designed for new experiences and relaxation surrounded by its private white sand beach. The rooms have plush bedding, well-equipped kitchens, traditional Mexican décor, flat-screen TVs, radio alarm clocks, premium cable, and voicemail. They also have luxury bath amenities, private balconies or terraces, bathrobes, slippers, hair dryers, sofa beds, daily newspapers, and minibars. Master suites have king beds and twin murphy beds plus two bathrooms, while the presidential suite has a king bed, two twin beds, three bathrooms, and a Jacuzzi. When you aren’t soaking up the sun on the beach, you can swim in the infinity pool. For a small fee, you can opt for an in-room massage, and internet access is available as well. There is access to outdoor hot tubs, infinity pools, and a concierge. For an additional fee, guests can also take advantage of the kids’ club, tennis court, mini golf, spa, or fitness center. All guests receive a complimentary American breakfast. Have classic Mexican dishes at Brigantine, Japanese at Sushi-Sun, lighter fare and drinks at the Sports Bar, international dishes with Mexican and Mediterranean inspiration at The Ridge Restaurant, or a casual meal at Calima above the pool deck. With historical scenery, stunning seaside views, and entertainment with lots of energy, this resort is sure to deliver a relaxing and unforgettable trip. 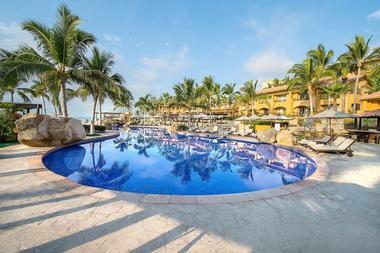 This family-friendly resort is high end and the 217 suites are all spacious and air-conditioned. They feature kitchenettes or full kitchens along with private balconies with views of the Sea of Cortez or the property’s exotic gardens. Other amenities include safety deposit boxes, LCD TVs with cable, phones, wireless internet, ceiling fans, irons, oversized bathrooms with both a shower and tub, minibars, and clock radios. You can choose a room with a separate walk-in shower, whirlpool tub, double vanity, and multiple bedrooms and bathrooms. The two swimming pools on the property are large and dramatic, featuring cascading waterfalls and amazing views. There is also an on-site watersports center where you can rent paddleboards, kayaks, and more. El Bucanero has a pirate theme and serves lighter fare and comfort food. Neptune serves fresh local seafood with French techniques and Cabo flair along with amazing drinks. The American Grill has a la carte breakfast by the pool, a taco bar, and a South American grill. El Patron serves traditional Mexican dishes featuring a contemporary twist.